When did you realize that maps and mapping were truly interesting things to create or use? The tremendous response to GIS over the last 20 years did not happen by chance. As children, when we matured from being self-centered individuals to externally oriented people, we developed a strong sense of place and a strong curiosity about the world around us. The spatial point of view was latent within us. Educational theorists have always said that a spatial perspective exists among all normal people. When we are still in diapers, we begin to sense where things are relative to where we are. But for most of us, as we develop into children and young adults, the spatial perspective is not tweaked. If no friend, teacher, or relative helped stimulate that natural tendency, or our circumstances limited the world that we could have possibly known, we might have said, as so many people have said in the past, "Geography is not one of my strong subjects" or "Maps don't mean much to me." Unfortunately, most people lacked that stimulus, but the readers of this article have been fortunate to have discovered GIS. 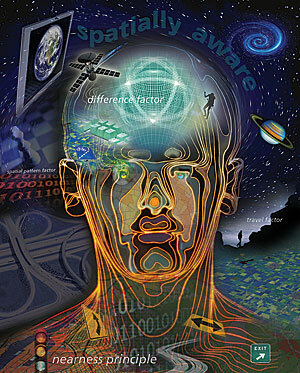 GIS; GPS; and the marvelous gizmos, gadgets, software, hardware, and Internet sites virtually make the earth come alive. We have been exposed to this wonderful new technology and the software that allows us to explore our environments. Now we can't get it out of our systems. If it is a location we are talking about, usually our first inclination is to check it out on a map. We have become spatially conscious, spatially aware, and geographically sensitized. We are thinking geographically. Our world is much fuller for these experiences. We better understand the land, streets, paths, streams, patterns, networks, hills, and slopes. They are ours. We meet a colleague or fellow worker and immediately launch into a discussion of how we can do something on the computer that will bring us even more understanding. This is done without skipping a beat. No need to start with first principles. One spatial thinker is interacting with another spatial thinker. GIS and all of its related techniques and methods have helped open our geographic door. Now we "see everything," manipulate it, overlay it, add to it, and make great prints of what we have created. One of the wonders of these discoveries and activities is that many of us earn our keep being professional spatialists. I use the word spatialists purposefully, because it is by virtually manipulating earth space that we have tweaked our natural tendency to develop our spatial cognitive abilities. "Spatial" has meaning to the extent that it is spatial concepts that hold us together and allow us to skip all the preliminaries and get right to our interactions with the earth, with maps, and with colleagues. It is easy to say that we are in the same geographic boat, but it is a challenge to try to deconstruct that boat and find what keeps it floating. What elements of spatial structure let it sail unimpeded? I am going to give it a try, attempting to put into words why we are all in this together. The first construct is our development, by nature and experience, of a sense of distance and direction that corresponds to real distances expressed as some measure, such as in the next block, halfway down that road, 200 feet north, second light on the left, 100 kilometers after the intersection, east for about five minutes, and so on. If we are called on to express these distances time and again, we become better and better at it and thus become more accurate and more concise. We develop a vocabulary of locations and distances. It may include latitude and longitude, cardinal or polar projection directions, or some specialized coordinate language. If we are rarely in a position to think of distance and direction, we will not develop our ability to be anything more than general and thus will often be mistaken in our perceptions. But when we view maps day after day and are called on to estimate or give the exact distances from here to there, we become good at it. When we have marvelous technological tools to help with the process, we no longer say "100 meters south" when we mean "125 meters at 210 degrees." So the experience of working with maps leads to our discovery of spatial relations, which in turn gets our spatial perspective going in high gear. The second construct is what might be called the "nearness principle." We are better at discussing nearby conditions and situations than those far away. This might be considered the experience or repetition factor. If you see it enough, read about it enough, or hear about it enough, it becomes part of your psyche. Of course, that has always been the case, but now, with all of the tools available to us and our newfound appreciation for distance and direction, the nearness principle takes on great meaning. Many of us have become specialists in ferreting out the problems of our home area, such as environmental issues, public service issues, planning issues, and so forth. We are entrusted with making these issues clear so that they can be acted on. Our knowledge of place, especially our home place, has increased significantly. We see spatial relations, such as the effect that a new highway might have on drainage, in clear, concise ways. The next construct comes from field experience: the travel factor. Some children are glued to their handheld devices as their family vehicle winds its way through the countryside. Traveling at 75 miles an hour in a car does not lend itself to gazing out the window. But distance and direction, the nearness principle, and our more conversant knowledge of the landscape have led us onto trails and into never-before-seen towns and city neighborhoods. The number of campers, hikers, sailors, and tourists has increased greatly in the last 20 or so years. Much of that increase corresponds to the ever-increasing use of the computer hardware and software related to our GIS interests, including portable GPS instruments. Hikers with this technological experience do more than identify elements of the landscape. They observe differences in the land due to changes in elevation, rainfall, geologic structure, new buildings, changed traffic patterns, networks of interaction, and so forth. Consequently, those of us fortunate enough to use GIS regularly get so much more from field experiences than those unable or unwilling to put down their cell phones or other distractions. Next is the spatial pattern factor. Dealing with maps on a regular basis stimulates thinking about the peculiar configurations of our environments. We are aware of flows between places, clustering of objects, densities, intensities, and magnitudes. This leads naturally to an appreciation of spatial relationships. What kinds of things are associated with other things and to what extent is there interaction between them? An example of this is a traffic patternthe need for commuters to work within a reasonable distance of their homes. What spatial associations and spatial interactions occur because of the need to go to work? When we view the complexity of commuting for a single person or for many individuals, our GIS background allows us to view this in a spatial framework. No wonder traffic experts have strong GIS experience. We have what we might call the difference factor. Of course, everyone knows that Mumbai, India, differs in many ways from New York City. GIS puts us in a better position to define those differences. Because we better understand our local environment, we have meaningful benchmarks. Our knowledge of water levels in our streams during high runoff periods, temperatures in the canyons at 2:00 p.m., traffic tie-ups at rush hour, land values across town, local government dealings with various interest groups, and so on, helps uswhen we are faced with the facts of the other placeassess the differences between here and there. This is our newfound ability to become comparative spatialists. Knowledge of an issue is not complete until we have some way to evaluate it. Let's use an Internet mapping tool or manipulate our GIS functions to bring this "extra knowledge" to bear on the problem. Spatialists are open to comparisons, since their perspectives allow for a sense of what it is like elsewhere. Finally, I must include a particularly important nonspatial factor: computers. Were it not for our ability to manipulate this ever-advancing technology, and our constant use of computers, the chances of developing our spatial tendencies would be limited. But when the entire package is put together, we find a level of congeniality that brings a high amount of enthusiasm and dedication. In the field of geography, the spatial principles and factors come under headings of spatial interaction, distance decay, gravity models, spatial autocorrelation, scale, and others. All of these can be formalized into topics, subtopics, statistics, and models. Geography is like many subjects, such as economics, where supply and demand can be reduced to a series of equations. What is important, however, is that the foundation is laid for any further study of a field of knowledge. We are, or are becoming, GIScientists. Before the advent of the GIS revolution, our task in ferreting out the complexities of the world was very difficult, but now we have laid the spatial foundation. We think spatially. We are on the same ship held together by the same structures. Arthur Getis, distinguished professor of geography emeritus at San Diego State University in California, is author of many books and papers ranging across the geographic spectrum. He was awarded distinguished scholarship honors by the Association of American Geographers and the North American Regional Science Association. He served as president of the University Consortium for Geographic Information Science and as editor-in-chief of the Journal of Geographical Systems. For additional information, contact Arthur Getis (e-mail: arthur.getis@sdsu.edu).